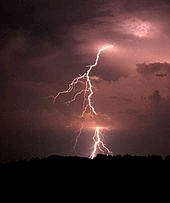 While I appreciate and enjoy the ways in which harnessed electricity makes our lives easier and more entertaining, I much prefer the wild exciting energy of raw electricity arcing across the sky during a thunderstorm. Here in the Midwest we have some amazingly beautiful lightning strikes and displays that out class the best fireworks show. And there's also that moment of waiting till the thunder comes, a brief pause and BOOM! Thanks, m'dear! Glad you've found a way back into it!